Whenever a guest knocked at the door, the porter replied ‘Deo Gratias’, opened the door, and greeted him with the Benedictus. Thereafter, he humbly asked what the visitor wanted, bowed and seated the visitor in his cell while he went to announce the arrival to the abbot. 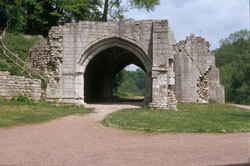 The porter or his helper, manned the abbey gate from Lauds to Compline each day. He was a monastic official of some standing, and several monks who held this post were promoted to the abbacy. He wore the scapular while working and whenever the Offices were sung in the church he was to pull up his hood and remain in silence. At the end of Compline the porter closed the gate and returned to the cloister.